Current routers look antiquated. There boxed design and sharp edges remind us of those times when cathode PC monitors and dial-up modems ruled our homes. Not to mention, most routers are horrible. Setting these devices or completing a simple task such as renaming your network of changing your password require a certain degree of computer literacy that are inaccessible to average users. But Google is simplifying things. With the new OnHub wireless router made in partnership with TP-Link, the tech giant is introducing a powerful, simple, and beautiful home networking device. With this device, Google is solving three biggest drawbacks of current routers—setup, troubleshooting, and coverage. Of course, with the high price tag that competes with advanced routers in the market, OnHub is up for a heated competition. The question: Should you or should you not buy the Google OnHub? This review provides a detailed rundown of this new device. 1. Fast and seamless Wi0FI coverage and throughput. OnHub has a total of 13 internal antennas—six for a 2.4 GHz network frequencies, another six for a 5 GHz network frequency, and one congestion-sensing antenna to monitor the network performance and automatically tune the radios to the best setting. By supporting both 2.4 GHz and 5 GHz frequencies, OnHub is able to provide a Wi-Fi speed of up to 1900 Mbps. 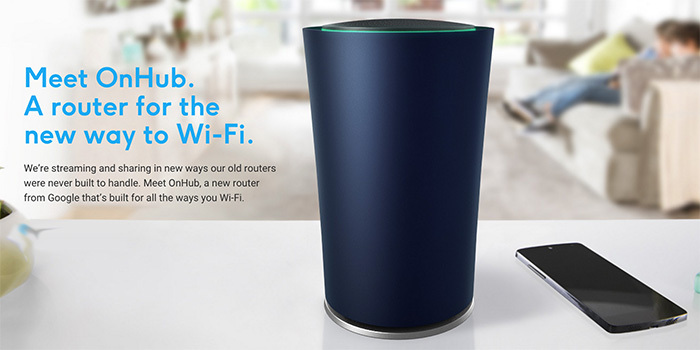 Compared with other routers, OnHub does not separately broadcast the 2.4 GHz and 5 GHz frequencies. The SSID or network name covers both frequencies and the device dynamically adjusts the network depending on which frequency has the best blend of speed, coverage, and minimal interference. It is a smart wireless router. 2. Easy software and hardware setup and management. Almost all routers out there come with dreadful software. Setting a password or changing the network can be a problem for average users. Google has developed a user interface that is simple and intuitive. Take note that everything on the OnHub is done through the Google On app available for download on at least Android 4.0 or iOS 7 mobile devices. There is no web interface that is usually available in most routers. Setting up OnHub is very easy. Plug the device to a power source, download the Google On app on an Android or iOS mobile device, and go through a simple and intuitive setup process that mainly involves holding the mobile device near the router, pairing it via audio signal, and initiating the initial configuration. The entire process can only take around five minutes, including naming the network and setting a password. It is important to remember that setting up requires a live Internet connection and a Google account. Regardless of what device you use to setup OnHub, users need to first sign-in with a Google account. There is more to the Google On app than setting up OnHub. The app indicates what devices are connected to your network and which ones are using the most bandwidth. It also allows users to prioritise bandwidth to specific devices. Rebooting OnHub is also done using the app. The app also has speed test features—both for determining speed between an ISP and the modem, and between OnHub and wireless devices. It also tells users what the measured speed can do. 3. Beautifully designed for convenience and ease of use. Current routers are ugly and most of the time, they are left hidden under the basement, inside a drawer, or somewhere in the deepest and darkest corner of living rooms. The OnHub is gorgeous. It is a sleek cylinder-shaped device with no protruding antennas, ugly ISP logos, and arrays of LED lights. Google wants users to place this device centrally in their homes—the most ideal position for wireless coverage and range—or somewhere that is not hidden from plain sight. With its minimalistic design, household members or visitors could easily confuse OnHub with a decorative fixture. Plus, the device has a dimmable light ring that uses one of four colour indicators to give feedback. 4. Future-proofing with numerous possibilities. Google says the OnHub is designed to support future smart devices. It supports next-generation technologies including Bluetooth Smart Ready, Zigbee, and the Google Weave platform. The tech giant also mentioned OnHub will pack more features in future firmware updates. However, it remains unclear what exactly those features or upgrades will offer. 1. The app lacks futures available in most routers. Although the Google On app provides ease of use, it lacks several important and popular features available in most routers. These features include guest network, parental controls, firewall, dynamic DNS, virtual private network, and content filtering, among others. There is also some problem in identifying the devices connected to OnHub. The app names connected device after the manufacturer. For example, if an iPhone 6 is connected to the network, the app will show it as “Apple” and there is option for users to rename it. This is problematic if there are users who use several device from same manufacturer. 2. Simplified design means compromising some hardware features. Google left out a few things that are usually available in several routers—especially in devices with the same price point. For instance, there are only two Ethernet ports: one to plug the device in the modem and the other one to use for wired Internet. This single Ethernet connection port for Internet use can be problematic for power users who want wired connection to run their desktop or laptop computers. Of course, there is an option to buy and use a network hub but using this adds complexity and thus, defeats the central concept of OnHub. There is also a single USB 3.0 port on the OnHub but it is currently inactive at the moment. It is essentially useless because users cannot hook up a networked printer or hard drive. Its sole purpose is for USB recovery in cases when the internal software gets corrupted. 3. Considerably expensive with the availability of alternatives. Selling at $199, OnHub is considerably expensive. There are other wireless routers available in the market with same price point. Consider Airport Extreme from Apple as an example. Both devices have similar specifications and offer the same concept of simplicity. However, the Airport Extreme has three Ethernet ports and a functional USB port. The high price tag would also compel some users to instead opt for a more feature-rich routers that are more suitable for power-usage and office use. Verdict: Should you buy the Google OnHub wireless router? OnHub is a perfectly designed wireless router that is both beautiful and compact. With ease of use from simple setup and management using an app available for download on an Android or iOS device, the device is for users who wants an easy setup and a powerful Wi-Fi signal without fussing around too much on technicalities. But the high price point and lack of some advanced features available in devices under the same price category can turn off power users. In its current state, OnHub is a wait-and-see device. Future updates might bring forth additional features, especially for future smart devices. With that said, it seems the trade-off should be worth it for customers who want to gear away from ugly routers with horrible software interface. If you are this person, then Google OnHub is definitely for you. Photo credit: Google, Inc.